Various moves within the digital music market have strong implications for mobile marketers. Barring any unforeseen circumstances, Pandora will be purchasing “key assets” from Rdio, as the latter files for bankruptcy. That accelerated strategy will launch the company into the on-demand music sphere, competing directly against major players Apple Music and Spotify. Some 80% of Pandora’s streaming reportedly happens on mobile, and the majority of Spotify’s music streaming comes from mobile devices as well. Apple has had its own problems with mission creep and a cornucopia of unasked for add-ons to their app. Based on the amount of time consumers are spending on mobile, the success of all these streaming services will be contingent upon the strength of their apps. And the strength of their apps will be contingent upon the unique strengths of their core offerings. Rdio will be sold for $75 million after receiving approval for their bankruptcy filing, but the deal has a slight possibility of not going through: “While we are filing for bankruptcy, because the planned sale to Pandora is contingent on such a filing, by law Rdio is required to entertain competitive offers during the bankruptcy process that is being managed for us by Moelis & Company,” Rdio noted in a statement. Pandora will have its work cut out for it negotiating more streaming deals in the wake of the Rdio purchase. But if it is successful, the move could bring new relevance to Pandora in the mobile sphere. Other companies have made recent digital moves. Google launched a dedicated music discovery app called YouTube Music last week. 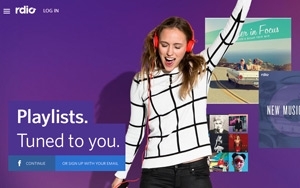 T-Mobile brought its unlimited music streaming, which supports Apple Music, Spotify, and other digital radio services, to its MetroPCS customers. Some analysts predict there will be more consolidation when the dust settles.